As of 1st April 2019, LIFEPAK discontinued the LIFEPAK CR Plus and LIFEPAK EXPRESS AEDs in all countries that require CE mark certification. These have been a premier choice of AEDs for first responders and communities since 2002, so there are lots in circulation! We are committed to continuing our service to the customer that already have these products. For this reason, we will still offer the CHARGE-PAK™ battery chargers and electrodes for these discontinued models. The 8-year warranty will still be honoured on recently sold LIFEPAK CR Plus and LIFEPAK EXPRESS AEDs. Easy to use – Intuitive interface with no button operation, eliminating the need for the operator to manually deliver shocks. Visual and voice prompt that guides the operator through the process. 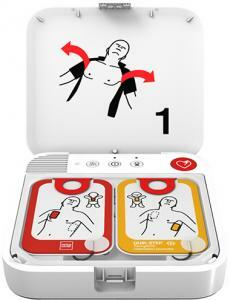 More hands-on time – The only AED we supply that allows CPR to be performed during heart analysis. LIFELINKcentral AED Program Manager – monitors its maintenance status, whether it has been used and delivers location information via wifi connectivity. Portability – With the option of sim card connectivity and an IP rating of 5.5 making it well protected from water and dust. Paediatric mode – Can be used on children under eight years of age, at the press of a button.